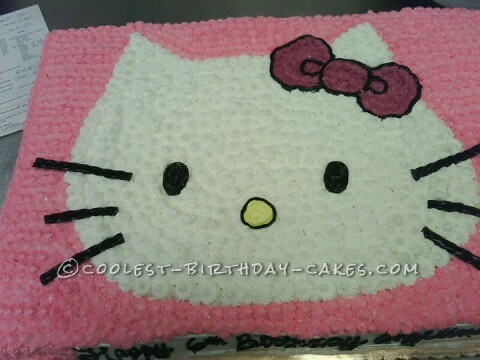 This Hello Kitty cake took me awhile to complete and was extremely tedious ! I used the “star fill” technique which is to use your star tip to fill in a large space. They actually make a tip which is a “star fill” tip which kind of looks like 3 star tips in one which will take less time and is easier on your hands. This was done for a customer of mine when I worked at a local grocery store. It was a full sheet size and you cant see it in the picture but the star fill was done on the sides as well as all over. I used black licorice for Hello Kitty’s whiskers, and needless to say the customer and her daughter loved it and went nuts for it ! It’s always worth the time took to see the child’s reaction, for me at least! If you want to try this my advice is to keep your icing a little soft but still able to hold the star shape, and just take your time and have fun with it ! I hope y’all enjoy!